Smartphones and tablets are everywhere, and they’re changing the way we learn. Employees can access the performance support they need right when they need it. But mobile learning also presents challenges for e-learning developers. One of the major challenges course creators face is the sheer number of different mobile devices. New models with their own technical specifications (screen size, operating system, etc.) come out all the time. How can course creators deliver an optimal learning experience, no matter what device the learner is using? Some e-learning authoring tools require authors to customize layouts for different devices, one at a time. When you do that you’re basically creating the same course, over and over again. What a chore. We believe that technology, not course authors, should do the heavy lifting to ensure a great learner experience on every device, every time. That’s why we’ve developed Rise 360, a web-based authoring tool for building inherently responsive (and visually stunning!) courses. What makes Rise 360 different from other responsive authoring tools? Simply put, it makes creating responsive courses super easy. You can build courses right in your browser with the confidence that they’ll work automatically on any device with no additional effort on your part. And one of the amazing things about Rise 360 is how gorgeous every course looks. With Rise 360, you’ll get a professional, beautiful course every time. Intriguing, right? Let’s take a closer look. All you need is your web browser and your ideas. With no software to download, this intuitive web app is easy enough for anyone to use. Start with a course outline, or build each lesson as you go. It’s up to you. As your course evolves, you can make quick changes to the order of lessons anytime by dragging them wherever you want them. And no matter what lesson types you choose, your course will look truly gorgeous, effortlessly. Ready to see how it’ll look for your learners? Preview each lesson separately or view the course as a whole with just one click. Rise 360 makes it easy to build e-learning quickly. And it's not just for mobile. The content you create in Rise 360 works in any browser and on any device. 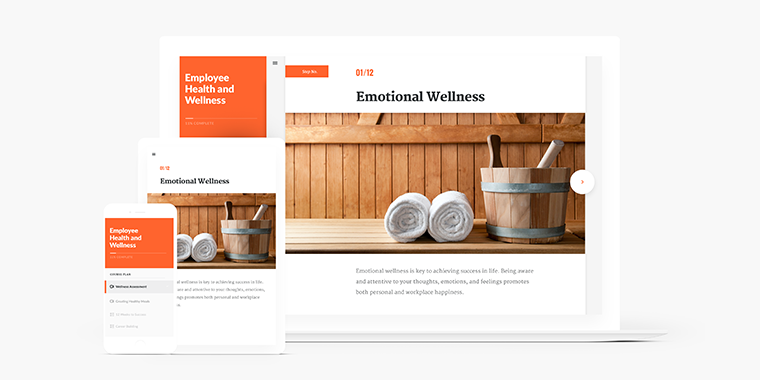 In addition to being mobile-friendly, Rise 360 courses are also modern, elegant, and easy to brand. Just drop in your company colors and you’re all set. To build lessons in Rise 360, simply mix and match different learning blocks to create unique learning experiences. Let’s take a quick look at few examples of the different kinds of blocks can you build with Rise 360. Walk learners through a process, present information in chronological order with an interactive timeline, give learners a visual tour of an image or a diagram, and more. Building engaging, interactive content online is a cinch with Rise 360. Allow learners to check their understanding or engage content more thoughtfully with multiple choice questions. Capture your learners’ attention by adding engaging videos or practical screencasts you create with Peek 360 or Replay 360. These look beautiful, right? That’s what you get whenever you create e-learning content with Rise 360. Publishing your course is a breeze. Every course you create in Rise 360 adapts automatically to every smartphone, tablet, and computer. You don’t need to call IT or spend hours manually tweaking your course to fit every screen size or account for every breakpoint. Lessons authored in Rise 360 are inherently responsive without sacrificing your content. The content in your course will reflow to properly fit the screen on any device your learner is using. All lessons authored in Rise 360 are SCORM- and Tin Can API-compliant, so they play seamlessly in your LMS. So what makes Rise 360 so awesome? It’s fast, simple responsive course authoring, done right. Hi, Can you add audio to the lesson blocks? Rise is great and very accessible for those who haven't the time or the experience to use heavier authoring tools. We can get our subject matter experts to go quite a bit of the way using RISE for quick turnaround basic courses. Well done! I've a couple of questions re features that would make it even more powerful. (1) Will it be possible to present different pages depending on the score on a quiz and/or based on the lesson having been completed? (2) is it possible to embed a web form without it having to open in its own browser window? (ie without having the URL on display - we're thinking for example of issuing badges for success and can do that via a 'claim form' on our system. Hi Iain, I investigated into this further, and found out that this is likely happening because the website you're trying to embed doesn't support iframes, which is what we're using to embed the content. wow..thank you for being so kind and pursuing this. Sounds like a possibility. I'll check that out with the other website and see what might be possible. But it's great to hear that this can be done through iframes. Many thanks. Hello again Iain, I looked into this further and it looks like I misunderstood how this works. Here's the official word: "Rise currently handles iframe embeds like we handle regular url embeds. Iframes are not truly supported yet." I'm so sorry for the confusion! Be on the lookout for this feature in the future. Am I right in thinking all Rise course source files, content etc are all stored on your servers? I'm just thinking about the ramifications of building everything in your online system and not being able to version control / save locally and the impact of having lots and lots of course materials on filenaming / organising. I'd like to know this too - as my clients would need access to any content I create for them. Yes, all the content is stored on our servers. Is their any option to reduce the top bar? The interface can't be modified other than changing the color. You have the option to choose bullet points, check boxes, or numbered lists. You're correct, that option is not yet available but is coming very soon! Stand by. Can we add different style of bullet points and do animation for each bullet? Also is it possible to introduce splash full screen with background image beginning of the course? There are 3 different kinds of bullet points as of now: regular, checkboxes, and a numbered list. There are no options to animate because it's not like a PowerPoint slide where you have audio that's synchronized with the bullet points. The bullet points stand on their own. You can add audio, but it's separate. So in my mind, there would be no reason to animate. And I'm sorry but I didn't understand your last question. Can you try to explain in other words what you mean? Rise would be great. Love the look and feel and ease of development. However, we're having issues publishing due to AICC not working in IE. SCORM 1.2 woks everywhere but iOS and SCORM 2004 works on desktop but not mobile. Is there a timeframe on when these will be worked out?